The 15 British sailors held captive in Iran for nearly 2 weeks were all set free yesterday and have been reunited with their families in the UK. Speaking today, the sailors told tales of blindfolds, isolation, and "psychological pressure". But all that aside, before they left, Iranian President Mahmoud Ahmadinejad gave the sailors gift bags containing "handicrafts, a vase, and Iranian sweets". You don't have to read it twice. 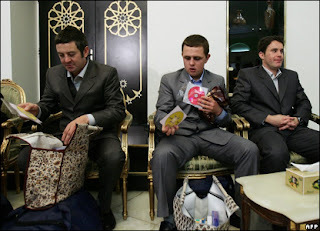 You caught it the first time, Iran gave their captives SWAG to take home. "Here's a little memento of that time you were held captive. Thanks for visiting Iran!" Now, I'm not knockin' it. I think it was fantastic that all parties involved could come to a peaceful resolution of this latest conflict and it got me to thinking about how the U.S. treats its captives. I don't think we give our detainees at Gitmo anything when we send them packin', perhaps because our detainees never get to leave? Oh! Maybe we keep them so long without legal representation or formal charges because we don't have the gift bags ready for when we ship them home! Ah ha! That must be it! So, as a service to the U.S. Armed Forces, State Department, DOJ, CIA, NSA, etc. how about we use the comments section to come up with a list of appropriate items that should be included in the U.S. "Thanks for Visiting Gitmo" Swag Bag. Keep in mind that U.S. Citizens detained at Gitmo will have to pay taxes on these gifts, so try to think of things with high intrinsic and sentimental value, and low monetary value. And...GO! *Thanks to Gil for the tip! Hows about a lovely photo album of pictures the guards took during their visit? To be honest, I am not sure I've ever tried an Iranian "sweet" before.